QB2 had the most liked content! Cat sailing, sailing event promotion, state,national worldwide and web. Looking to source a 7 m maricat mast or similar to detune a Mk5 A class as the 30 foot carbon mast is a scary handful in a typical 20+ seabreeze. I want to keep the A as it is a delight to haul around and to save my aching back, and detune it so its easy to handle in 20+ knots without being out of control . Suggestions? Conditions went from perfect 10-14 knots to 17 and up in the space of fifteen minutes and bramble bay at Woody Point quickly gets a short, vicious chop especially wind against tide and we had the mari and lots of laserrs falling over in a heap before heading to shore.. Yes Zane should have eased sails but didn't touch a rope and bored it in . 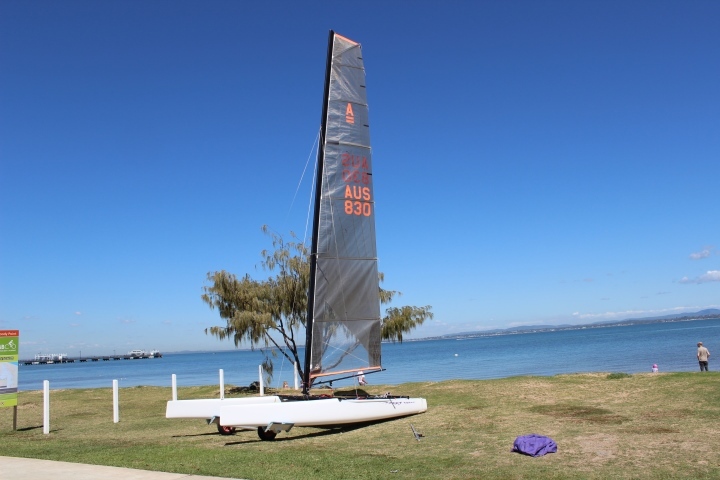 Humpybash regatta is on at Humpybong Yacht Club, Woody Point, 20 & 21 October. Around 80 craft are expected to attend with a large contingent of youth sailors and their families attending. Three races held on the Saturday and again on Sunday. Humpybash is among one of the last regattas before the Australian A class nationals and the worlds at Hervey Bay in November HYC runs the youth and senior racing on separate courses. There is camping available at the club and plenty of other accommodation at Redcliffe. Only a week to go until Winterbash on 29 and 30 July.. Go to Humpybong yacht Club website http://hyc.net.au/ for further info .. Water temp is 20C so pretty inviting still for winter time .. three races next Saturday and a marathon from Woody point to Sandgate and Scarborough and return depending on conditions.. Excellent conditions tipped by weather sites. Race attracted 60 entrants last year and hoping for a larger catamaran and dinghy fleet this year. Senior and Junior divisions held on separate courses Camping available outside the clubhouse or accommodation on Redcliffe peninsula..
What pressure to run in a 4.80/4.00-8 trailer tyre? not good.. hope Mr Day is okay ..
where are you off to in the near future?